Federal law requires that workers who customarily receives tips on the job be paid at least a “tipped minimum wage” of only $2.13 per hour—a mandatory minimum that has not been increased since 1991. As explained in Twenty-three Years and Still Waiting for Change: Why It’s Time to Give Tipped Workers the Regular Minimum Wage, this separate, lower minimum wage for tipped workers leads to dramatically different economic conditions for tipped versus nontipped workers. The figure shows poverty rates for nontipped workers, tipped workers, and waitstaff and bartenders (who comprise the bulk of tipped workers) in the 19 states where tipped workers get the federal tipped minimum wage of $2.13 per hour, the seven states where they are paid the full regular minimum wage, and the 25 states where they are paid a base wage somewhere in between. As the figure shows, poverty rates for nontipped workers are fairly similar across the three categories of states. However, the poverty rate for tipped workers in $2.13 states is nearly 4 percentage points higher than in “equal treatment” states, where tipped workers get the regular minimum wage as a base wage. 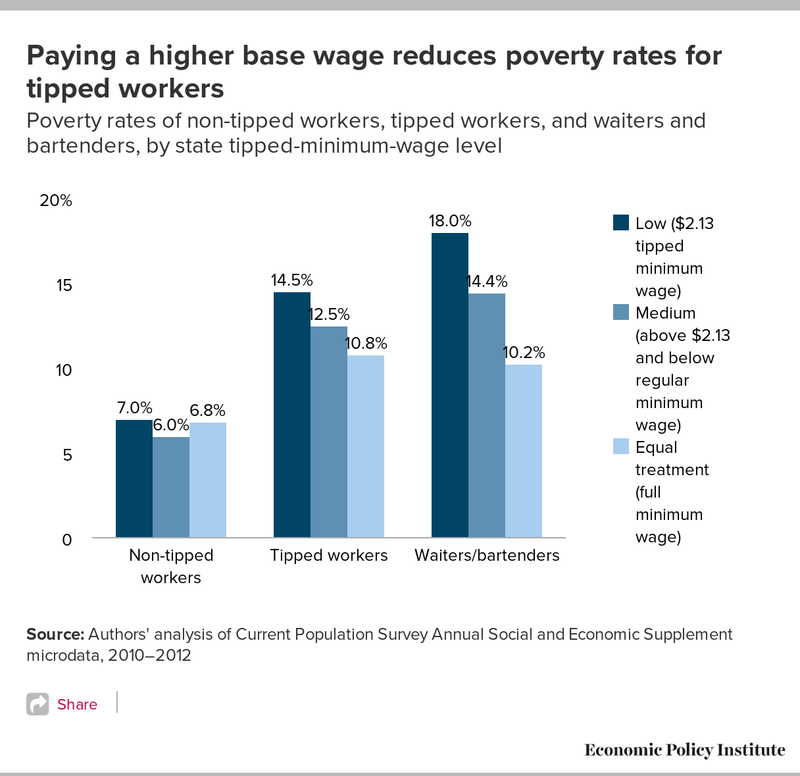 Among just waitstaff and bartenders, the poverty rate is nearly 8 percentage points higher in states where tipped workers only get $2.13, compared with the poverty rate in states where they get the regular minimum wage. If a worker’s tips plus the tipped minimum wage do not add up to at least the regular minimum wage for any given workweek, the employer is supposed to make up the difference. In reality, however, this requirement is difficult to enforce and there is considerable abuse. In Alaska, California, Minnesota, Montana, Nevada, Oregon, and Washington, tipped workers receive at least the regular minimum wage as their base wage—thereby eliminating these enforcement challenges, and helping stabilize incomes for tipped workers.